I read this for my history of architecture course, and despite the eurocentric view, it's just a fun read (if you're an architecture student who is fond of classical architecture and hearing it be described to you floats your boat). Summerson's six radio lectures about architecture is a short read, very easy to follow. It guides the Orders through the Renaissance, Mannerism, Baroque, Neo-Classical, and Modern architecture, briefly explaining some of the greatest works and architects form these periods. The premise being that classical values lie in the harmonious relationships of parts, it is important to know why and how this ideal has sustained itself over time.The book seems to skim over the surface of the matter, but still required background familiarity with the Orders (Tuscan, Doric, Ionic, Corinthian, Composite/Italian). The book works well as an introduction to classical architecture and its values and shifts over time, but it is by no means a stand-alone kind of book. Also, probably since these lectures were broadcasted by the BBC, there is a lot of emphasis on British architects and buildings. Three stars. I will never understand books on architecture that have tiny greyscale images, all pushed to the last pages of the book. Thank the heavens for Google Images. This is a good intro to classical architecture. However, it's a little too Brit-centric, which is forgivable since it was originally a BBC radio broadcast. Sometimes the author forgets that he's addressing a non-architectural public, so those college days sitting in an architectural history course definitely came in handy. But, with google images nowadays, I think a novice could work through this book and walk away with a keener eye for classical motifs. O livro só peca pela constante necessidade de trocar de página para observar as figuras que o texto faz referência. O movimento moderno é avaliado muito precocemente o que torna seu texto pobre, além de cometer o erro de tentar estabelecer relação entre a linguagem classica e moderna, tendo a felicidade de não cometer o mesmo erro com o gótico. I read it in Portuguese. 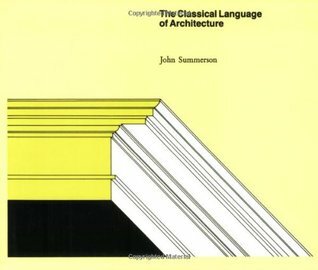 It's the best book about Classical Language on Architecture. It's clear, succint and easy to read. It goes from the first civilizations to use that form of expression, to the latest. La arquitectura es un lenguaje que no se oye, sino que se ve. En este libro se te habla sobre la esencia (simetria, orden, columnas, innovadores clasicos y modernos...) del clasicismo, uno de los dialectos mas puros de la arquitectura. So far out of my depth. A surprisingly witty book about architecture. Very British, both in language and in the buildings chosen for comparison to other European buildings. Really useful for the course I was studying in classical architecture. A true masterpiece about classical architecture that spans antiquity to 19th century European and American architecture. This is a brilliant book: unpretentiously erudite, pleasantly concise, quietly enthusiastic. A easily read narrative for the understanding of interpreting historic buildings. Read twice many years apart, and found it surprisingly still engaging.